South of Los Angeles and north of San Diego, a special slice of California looms. Orange County, easily one of the state’s most iconic areas, provides all the hallmarks of Southern California living. With its theme parks, manicured beach towns and laid back spirit, it comes as no surprise that many want to host their special events and gatherings in Orange County. In this California county, you can find an array of unique and offbeat venues. With art museums, classic car showrooms, historic mansions, zoological gardens, presidential libraries, beach resorts, yachts and even your own private boutique hotel, we have gathered up some of Orange County’s most unqiue wedding and event venues. Lions and tigers and bears, oh my! That is just what you’ll get at Rancho Las Lomas, a private resort and zoological garden event venue. Tucked away in the foothills in the town of Silverado, Rancho Las Lomas sits close to Irvine. Used for weddings, film shoots and corporate events, Rancho Las Lomas is a bit more unusual than your standard event space thanks to its resident Bengal tigers, zebras, alpacas, free-roaming peacocks and various birds of prey. The zoological gardens stretch across 32 acres of land and include a pond filled with koi fish and turtles. From your wedding to corporate event, Rancho Las Lomas features several different venue spaces. To start, the venue boasts El Teatro, an open-air theater nestled under ancient oak and sycamore trees. The marble stage makes a great perch for wedding ceremonies. Rancho Las Lomas also includes several other settings like Casa Bella with its spacious patios and lush lawn and the Grand Salon, an intimate setting with stone fireplaces, stained glass windows and French doors. All throughout the property, you can expect architectural accents like a large wooden gate entrance, fireplaces, decorative tile and cobblestone pathways. A few steps from the beach in the seaside resort town of Laguna Beach, Seven4One presents one of Orange County’s most unique wedding and event venues. Rather than hiring out a hotel ballroom, sharing spaces with other guests, this boutique hotel meets group vacation rental invites you to have the entire place to yourself for your family reunion, couple’s retreat, bachelorette weekend or wedding. With 10 guestrooms and two suites, Seven4One lends the feeling of having your own private beach house for your special occasion. As you’ll have the entire hotel for your event, you can truly customize the venue to fit your needs. Weddings appreciate a celebrity level of privacy and style not just by design but also with the addition of an in-house wedding coordinator. Your Orange County event will appreciate spaces like the roomy open-air interior courtyard. A second floor balcony looks on to the space with its living wall of cascading greenery and reclaimed wood. You also won’t have to worry about the weather thanks to the retractable roof. In addition to the courtyard, you’ll also have a second floor sundeck to use for cocktail events and smaller ceremonies. The setting faces the Pacific, lending a true Orange County setting. Best of all, when the party ends, your guests can retreat to their rooms without having to deal with transportation and more travel time. Located in Costa Mesa on East 17th Street, the Gray Matter Museum of Art has made a name for itself as a premier ultra modern space showcasing local artists. Luckily for those planning weddings and other events, the museum isn’t just for viewing on a casual Saturday. With its artistic and creative tone, the Gray Matter Museum of Art hosts events curated by Event Loft, a design firm in Southern California. Thanks to the changing array of artwork, you can always expect your event to feel on the cutting edge. With a design and ambiance focused on coastal living, the museum offers up several different settings for your event. Ceremonies generally take place on the roof of the building or in the nearby parkland. For receptions and other gatherings, the museum itself opens up its doors. You’ll appreciate modern yet cozy touches like polished concrete floors, an exposed ceiling and even a fireplace. The works of art on the walls bring uniqueness to your wedding or event too. The Gray Matter Museum of Art can host events for up to 132 guests seated and 175 guests for standing receptions. If you want to get married or throw a big company party in a presidential library, you can in Orange County. Located just 15 minutes from the Anaheim Convention Center in Yorba Linda, the Richard Nixon Library sits on 9 acres. The one of a kind venue provides a truly unique and historic space for your special celebrations and gatherings. It exudes a timeless elegance, tranquility and rich history that are hard to find any other venue. Venue settings at the Richard Nixon Library begin with the First Lady’s Rose Garden. Meticulously landscaped, most couples decide to exchange their vows here. In addition to small intimate events, you can also stage large gathering at the Richard Nixon Library thanks to the expansive lawn that can hold up to 400 guests. Other special touches to the property include a tranquil reflecting pool and a cute Birthplace cottage. The East Room, however, is a highlight for many. Stretching 4,800 square feet, the room is the only replica of the White House East Room in the world. You and up to 500 guests can appreciate its Presidential touches like magnificent crystal chandeliers, golden Italian silk curtains, marble fireplaces and a wooden terrazzo floor. Settled 15 minutes from John Wayne Airport, the Resort at Pelican Hill presents that typical ultra luxury hotel experience just south of Newport Beach. Lording over 504 acres of unrivaled coastal beauty, the resort offers up couples and those hosting events a classic coastal setting in Orange County. Events at the luxury hotel appreciate century old olive trees, rows of lavender and those 180-degree views of the Pacific. From weddings to meeting spaces, the Resort at Pelican Hill provides countless settings to host your soiree. The Event Lawn is a favorite for outdoor ceremonies, manicured to perfection and perched on the edge of a ridge, some 300 feet above the ocean. It also completes with an iconic Italian rotunda. Other settings include the Mar Vista Ballroom, separate from the hotel to lend utmost privacy and La Capella, an indoor space with fireplaces, wood beam ceiling and two picture windows gazing out onto the Pacific Ocean. Weddings are particularly popular at the Resort at Pelican Hill as a complimentary bungalow is offered to the bride and groom for their wedding night. Right in the heart of Anaheim and just 15 minutes from John Wayne Airport, the Colony House lends almost one-size fits all type event space. With a capacity for up to 750 guests, you will have several versatile spaces to host any type of celebration. Owned by 24 Carrots, a premier event planning company in South California, the Colony House fills with soft lighting and bright interiors for all sorts of events from holiday parties to reunions. Most events at the Colony House occur in the Great Room. With a capacity for 300 guests seated and up to 600 for more cocktail style events, the Great Room features vaulted ceilings, exposed brick walls and reclaimed wood accents. It bears that perfect compliment of being both stylish yet rustic at the same time. The Colony House also includes the Loft, an 80-person event space overlooking the Great Room. Geared more toward intimate gatherings, it can also be used in conjunction with the Great Room for events. The Colony House boasts several outdoor spaces for events in addition. The Deck sits next to the Loft and lends a small outdoor terrace for guests to escape to during events. The Porch presents a fully enclosed courtyard for open-air gatherings, complete with a living wall with different plants and flowers. The Backyard provides a flexible space for either parking or to place a tent for outdoor events. Dedicated to preserving, promoting and restoring the heritage of Orange County, the Heritage Museum of Orange County resides in Sana Ana. Available for weddings and private events, the venue provides a unique setting where you can celebrate with friends and family in a cultural and natural history center in Southern California. From corporate meetings to private parties and weddings, the museum can host sit-down events outdoors for up to 650 guests and smaller gatherings indoors. The venue settings center around a historic plaza with several buildings on the property from the 1890s, like the Kellogg House. The historic home is hailed as one of the finest Neo-classical Victorian homes in Orange County. Designed to emulate a 19th-century country estate, you’ll have several spaces to choose from for your event. The Gazebo Lawn for example sits right in front of the Kellogg House, providing a historic backdrop to your gathering. Featuring a charming white gazebo, the space can hold events up to 300 people. The Rose Garden Lawn also sits on the 11.5 acre property, available for weddings and other events. Classic car fans or even just those seeking a more out there event space in Orange County will find Crevier Classic Cars truly something to honk about. Nestled into Orange County in Costa Mesa, the contemporary state-of-the-art storage facility is also a space for classic car owners and enthusiasts to enjoy. The high-end custom garage and museum quality space also happens to host special events throughout the year. From your wedding to corporate event, you can celebrate and gather with vintage cars acting as your backdrop. The main event space features over 100 classic, exotic and rare vehicles on display. Furthering the vintage vibe, the glistening showroom walls adorn in oversized vintage art deco car ads. In addition to the main event space with its capacity for 300 guests, Crevier Classic Cars also includes a Ladies and Gentlemen’s Lounge complete with a pool table, three TVs, bar and dark wood floors. The setting also includes a dining room space with access to a partially covered outdoor patio. If you want a taste of Santa Fe in Orange County for your event, the Hacienda delivers. Set up in Santa Ana, the Hacienda is a former ranch estate, originally built in 1901. What as once part of an orange and avocado ranch is now an event venue with its whitewashed adobe building with a charming courtyard. From a wedding to a special celebration, events tend to take on that Southwest flair at the Hacienda. Most couples choose to get married in the garden chapel area. With its trees wrapped in twinkle lights, flowering plants and a fountain, it makes for a romantic setting to exchange vows. Overlooking the courtyard is the original adobe house, where brides can get ready for their big day. The Taos Room can be found inside the building, presenting a ballroom-like space in complete Santa Fe style. Also available for ceremonies and receptions, the venue features a two-story fireplace, grand staircase, classic Southwestern bar and traditional artwork. One of the main appeals to hosting your event in the Taos Room is that you can accommodate both large and small events throughout the changing seasons. Aviation fans rejoice over the Lyon Air Museum on the west side of John Wayne Airport. Founded by Major General William Lyon, the museum exhibits authentic aircraft, rare vehicles and plenty of memorabilia. However, what makes it truly special is that it hosts galas, corporate events, anniversaries, weddings and other events within the 30,000 square foot hanger. The unique event space invites you and your guests to dine, dance and socialize among the wings of vintage aircraft. With an after-hours feel, there are even docents on hand to provide guests with information on each aircraft. Not only does the Lyon Air Museum offer its banquet hall with the pristinely kept exhibits but its also lends a private jet grand entrance, a 30 person movie theater and unlimited access to all of its historic aircrafts. The vast space can be customized for your event with the capacity for up to 400 guests. Appropriately settled on to Second Street in Santa Ana, the Estate on Second boasts origins as the Southern Counties Gas Company. Hailing from 1923, the historic structure has now been turned into a place to celebrate. The full-service venue offers up a wealth of spaces throughout the Georgian Colonial style structure to appeal to different types of events. If you host your event at the Estate on Second you will appreciate amenities and services like in-house furniture and tables and chairs for your guests. For your wedding or event, you will have five different settings to utilize. The Crystal Ballroom regales with its crystal chandeliers, high ceilings, brick walls and exposed wooden beams. Grand celebrations work well in this space thanks to its size. The Attic space provides a more intimate setting for smaller events. It perches on top of the estate. The Terrace is well suited for evening cocktail parities and sunset wedding ceremonies thanks to its views of the city skyline. The Estate on Second also includes the Veranda space, a lounge style patio with glowing light posts and brick details, perfect for socializing. Right in the heart of historic San Juan Capistrano, within walking distance to Mission San Juan Capistrano, the Franciscan Gardens present a charming hideaway for weddings and events. Cozy in nature and still enchanting, the venue lends both privacy and seclusion for your big day. You’ll also appreciate a wealth of space with the property measuring in at 5,000 square feet. The venue spaces to choose from begin with the outdoor courtyard at the Franciscan Gardens. 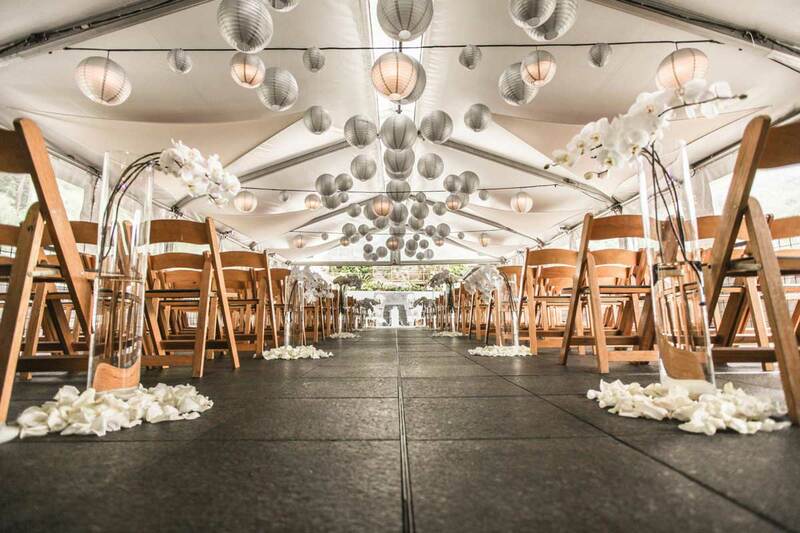 Surrounded by trees and accented with romantic café lighting and white paper lanterns, the courtyard can welcome 250 guests seated and 500 guests for more cocktail style events. In addition to the courtyard, the Franciscan Gardens also boast a Spanish style garden and both a bridal suite and groom’s lounge. The bridal suite is the largest of any event venue in Orange County, measuring in at 400 square feet. The Franciscan Gardens are perfect for those old-world charm catered events with its elegant wooden gates and pergolas with wrought iron candelabras. For those looking for a typical Orange County Oceanside beach resort, Monarch Beach Resort fits the bill with its setting on a hillside overlooking the Pacific. Located in Dana Point, the resort provides an effortlessly romantic vibe, accented by a championship golf links, space services, and dining. From meetings to weddings to corporate events, the premier luxury resort hosts it all throughout a number of settings. For weddings, Monarch Beach Resort lends the Grand Lawn to act as its signature ceremony setting. With the ability to host up to 300 guests, the setting also provides stunning views of the Pacific along with the addition of citrus and olive trees. For indoor receptions of a large scale, the Pacific Ballroom is up to the task. The 12,000 square foot ballroom outfits with coffered ceilings and dazzling chandeliers and can host up to 700 guests. For more intimate weddings the Botanical Lawn is well suited for up to 120 guests. In addition to weddings, Monarch Beach Resort is also equipped for meetings and other parties with more than 30,000 square feet of indoor meeting space and 60,000 square feet outdoors to gather. If you want to take your event off land in Orange County, naturally it’s possible with Electra Cruises. Specializing in providing a private yacht service, the company lends 5 luxurious yachts for weddings, parties, and corporate events. From a paddle wheel river boat to an ultra contemporary motor yacht, you can set sail on Newport Harbor, just beyond the reach of Newport Beach. The vessels range in size, style and capacity depending on what kind of event you wish to have. The Eternity can hold up to 150 guests and provides four decks and plenty of space for fine dining. Destiny can hold up to 100 guests. It features an open-air sky deck, a large dancing area and an all-glass ceremony room. The traditional and classically styled Newport Princess can also hold up to 100 guests and includes decks with scenic views and a built-in dance floor. The Athena comes with full bars and comfortable furniture for up to 100 guests. Lastly, the Electra is perfect for those small gatherings from 50 to 100 people. As the vessel hails from 1929, it comes chalk full of period furnishings. Framed by the canyons of Laguna Beach, Seven Degrees sits less than one mile from Main Beach. The award winning Orange County venue sets out to imagine and shape weddings, art shows and event of all kind. Built in 2001 in a modern architectural style, Seven Degrees also happens to be an advocate of the arts, hosting artists’ residencies. If you crave that artsy and modern vibe for your wedding or event, Seven Degrees delivers throughout its event spaces. Inside, you’ll find the Media Lounge, a large reception hall with in-house audio and visual capabilities. Outside, Seven Degrees dazzles with its gardens, a private outdoor area complete with a waterfall, pond, lush landscaping and views of Laguna Canyon. 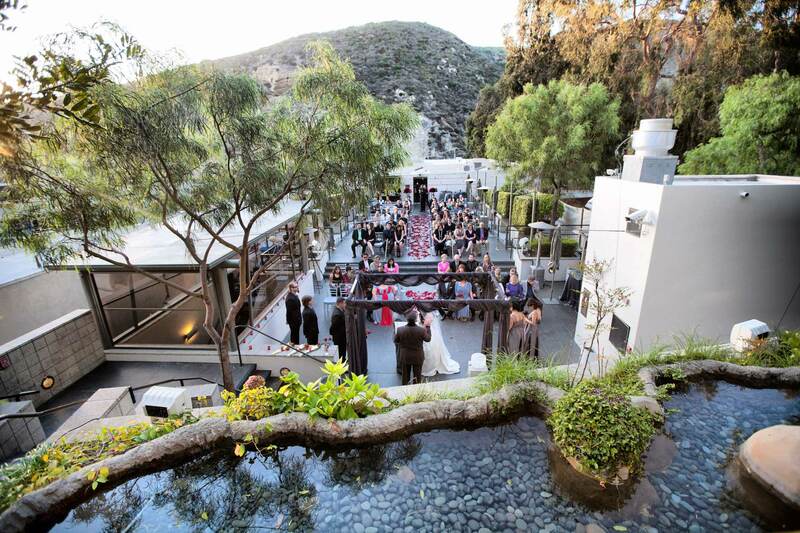 Outdoors, the venue also includes a terrace area overlooking Laguna Canyon for ceremonies and cocktail hours. Operated by event company 24 carrots, Ole Hanson Beach Club sits on the oceanfront in San Clemente, as it has since 1928 when it was built. The two-story public facility and adjoining public pool recently opened up for weddings and other events after a careful restoration. Named after Ole Hanson, founder and develop of San Clemente’s Spanish Village by the Sea, the event space embodies a true Southern California beach experience. Your event will center on the 1928 Spanish-Revival style building. Accented by classic arches and hand-painted tile, the building further stuns with its ornate stain glass windows and original crafted wrought iron grillwork. Events can enjoy both indoor and outdoor spaces, all lending views of the San Clemente coastline. With a capacity for 150 guests seated and 175 guests for cocktail events, the venue also provides tables and chairs for your event, an expansive Grand Lawn for ceremonies and gatherings and two outdoor terraces. Set up in Fullerton in Orange County, the Muckenthaler Mansion was originally built for Walter and Adella Muckenthaler in 1924. Located on 9 acres of park-like grounds, the Italian Renaissance mansion appreciates a setting with gardens, swaying palms and historic architecture. With details like a wrought iron spiral staircase and a wood-floored atrium with an ornate tiled fireplace, the Muckenthaler Mansion makes for a great spot to host your Orange County event with a dash of the past included. Venue settings include the Italian Garden. Most wedding ceremonies take place here amidst the lush palm trees and foliage. For more outdoor events, the mansion can host outdoor receptions on the Adella Lawn. The space can accommodate groups up to 400. In addition to the outdoor spaces, the Muckenthaler Mansion also offers indoor events in the mansion. Complete with rooms filled with art on the walls, you can host sit down receptions up to 120 guests within the mansion. Mainly used as a cultural center for touring art exhibits, the mansion also offers the possibility of having a tented wedding on site. Just two miles from the Pacific Ocean in Huntington Beach, the Red Horse Barn Wedding and Event Venue finds a home at the Huntington Central Park Equestrian Center. With its storybook charm and rustic farmhouse vibe, the venue proves ideal for all sorts of functions from fundraisers to corporate parties to weddings. Your event will appreciate all those equestrian and barn details like white paddock fences, an expansive terrace, broad lawns and a classic red barn structure. The Red Horse Barn Wedding and Event Venue sprawls across 25 acres and is home to nearly 400 horses, stables and miles of public trails. Most ceremonies on site take place in the garden area. Complete with a fountain, you can exchange vows under a gazebo. The space is also great for cocktails and games for other types of events. The Red Horse Barn also features two settings for brides and grooms to get ready. The Groom’s Getaway is also available for meetings and private parties with its polished wood floors, beamed ceiling and fireplace. One of the unique factors to the Red Horse Barn Wedding and Event Venue is that you can make a grand entrance for your wedding on horseback. Right down the road from South Coast Plaza in Costa Mesa, Dax Gallery identifies as a contemporary urban fine art venue. Opened with the goal of showcasing a taste of the street art movement, the gallery exhibits fine art, mixed media, photography, and sculpture. It is also available for weddings, corporate events, private dinners, and dance recitals. The unique and creative event space features white gallery walls, clean concrete floors and raw industrial elements. With a sort of blank canvas vibe, you can transform your event into virtually any style in the art gallery. Home to over 4,500 square feet of event space, Dax Gallery can host events for up to 150 people seated with a dance floor and 200 seated without a dance floor. There is also space for up to 300 guests in theater or cocktail settings. No matter your event type, you’ll appreciate exposed high ceilings, oversized windows and doors and loads of cool art on display to make your gathering all the more special. For that classic oceanfront feel in Orange County, you can look no farther than La Casa del Camino in Laguna Beach. The boutique hotel was once a favorite getaway among the stars of Hollywood’s golden age. Providing a quintessential Laguna Beach experience, La Casa del Camino boasts an oceanfront locations and Spanish style guestrooms with hand-carved furnishings. In addition to lending accommodations, the property also offers over 6,200 square feet of indoor and outdoor event space. Ideal for Orange County meetings, parties and social gatherings, many select to host their event on the Rooftop at La Casa del Camino. With its panoramic views of the Orange County coastline, the space can host events up to 120 guests. The on-site K’ya Bistro Bar lends another timeless event space at the hotel with 2,7000 square feet of customizable banquet space. Brunches and other small events can be held in the 200 square foot Cress Room with its quaint and historic feel. Have a favorite Orange County event venue? Share your pick with us in comments below.